I had a totally lovely weekend. Here’s a little glimpse. What a terrific two days it was!! Foodie Firsts is a Move Eat Create re-occurring feature focusing on my adventures in the world of food. Over the course of a few short years, I have transformed from a picky, fearful eater to a curious and open-minded foodie. 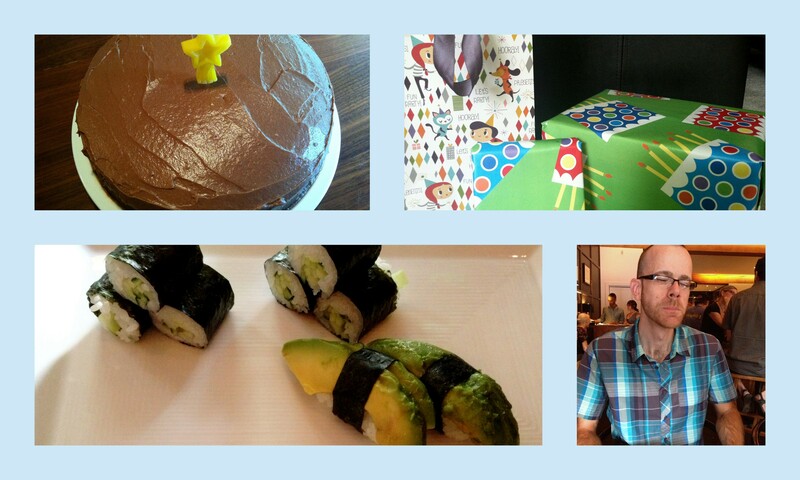 In a commitment to continue to expand my culinary experiences, I have started Foodie Firsts. I will commit to trying something new and sharing that experience with you. My endeavors may include experimenting with cooking techniques I’ve never tried before, testing a single new ingredient, or drawing upon my creativity to combine foods in ways I never imagined. Whatever it is, I will eat (or maybe drink) it and share it all with you. You can decide for yourself whether you, too, would like to try. Let’s be bold and eat good food! Are you ready for the ultimate Foodie Firsts column? I managed to hit several firsts for me in a single dish. I tried new ingredients (two of them! ), baked something I’ve never baked before, and ate something I’ve never eaten before. What can I say? I guess sometimes I just like to go big in the kitchen. 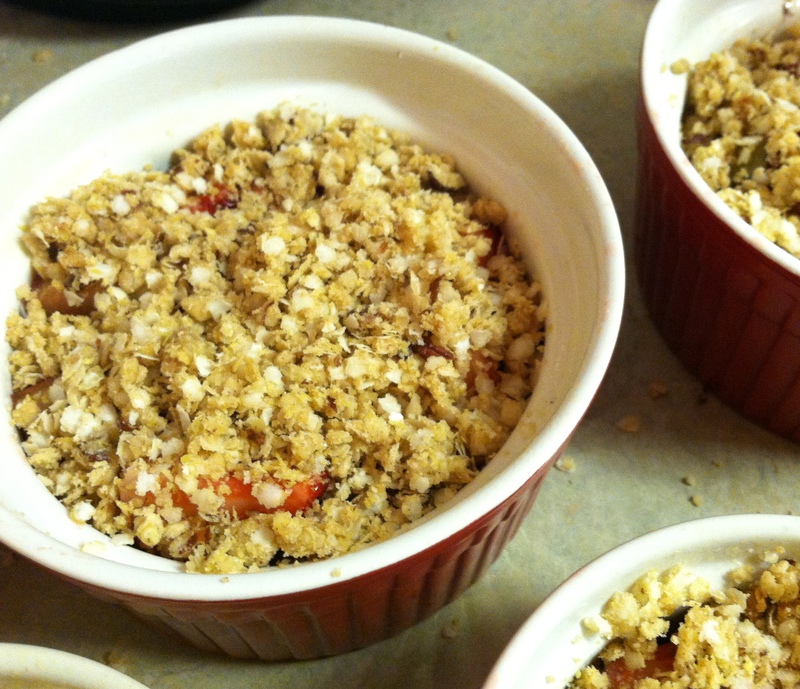 So I am presenting to you today a simply satisfying and relatively healthy strawberry-rhubarb crisp (gluten free and vegan, of course). I do realize that such a dish may be considered plain and common, but it may surprise some folks that I had never actually eaten a fruit crisp before. 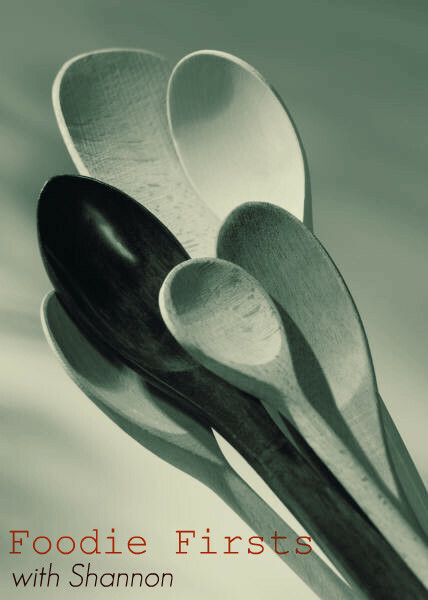 I swear to this on my favorite wooden spoon. You might know me well enough to know by now that #1 still stands (since I’m vegetarian), but #2 and #3 have gone out the window – happily out the window. I’m not even sure why or when I developed these rules, but we can all see their ridiculousness, right? How I lasted so many years without coffee is positively baffling. My decision to get over that last rule was only further validated by this crisp. I knew straightaway that my first crisp should include rhubarb (I’ve extolled its wonderfulness before). The trick, of course, was that most of my hoarded recipes were not gluten free, so I needed to ensure to find or adapt one for my needs. 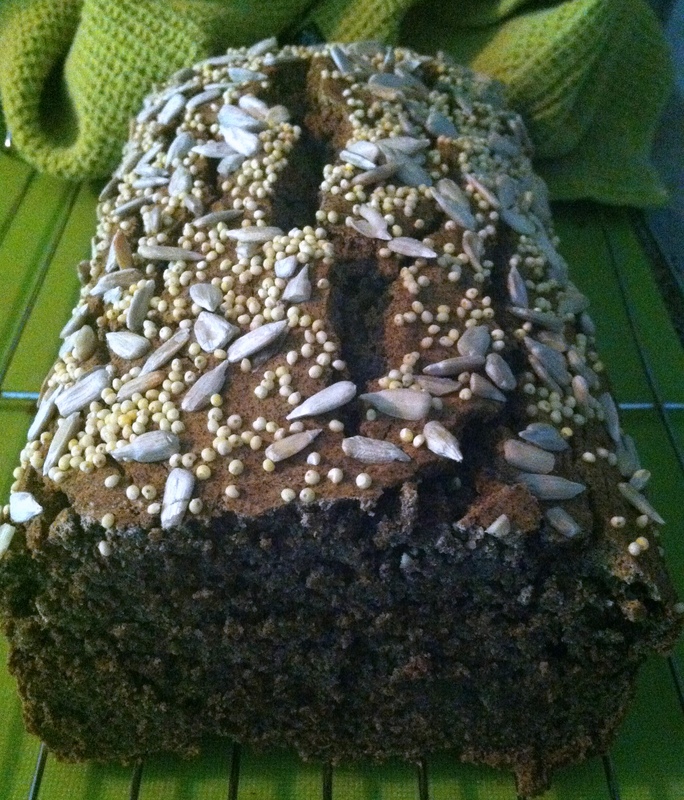 Fortunately for me, I case across this recipe on the Gluten Free Goddess’ blog which uses . . . wait for it . . . quinoa flakes in place of more traditional oats. Now, I can eat gluten free oats, but this substitution was very appealing. I had procured a package of quinoa flakes a few weeks ago when I spotted them on sale, but hadn’t touched them since placing them in my pantry. Now, just like that, they had a purpose. Then, to make things even wilder, I decided to test out stevia as a sweetener – another ingredient I had not used before. New ingredients. New dish. New dietary needs met. And so, the baking commenced. What resulted was a lovely, simple crisp incorporating a few of my favorite ingredients (rhubarb, hazelnuts, cinnamon), which was perfect for eating straight out of the oven, or topped off with a scoop of ice cream (I like So Delicious French Vanilla Soy Ice Cream). I will say that, being new to the flavors of stevia, I found it to have just a tad bit of bitterness that I didn’t love and I might consider using half stevia, half other sweetener in the future just to tone that down a bit. Although the soy ice cream toned that down, too! 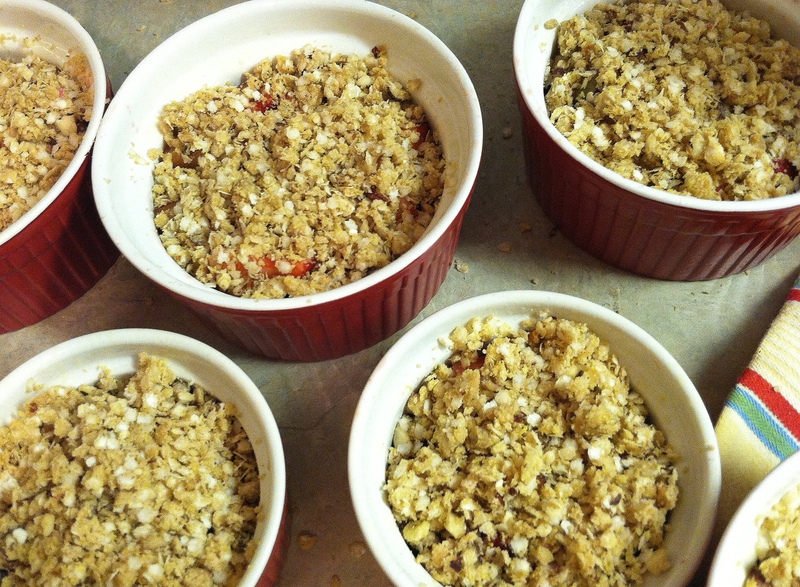 The quinoa flakes worked beautifully and I’m most excited to use them again. Serving Suggestions: If you like a very sweet crisp, this isn’t it – so add additional sweetener prior to baking. Alternatively, you can also drizzle the cooked crisp with maple syrup or agave – a touch that I found delicious. Lessons Learned: Just because a belief or practice has served you well (or at least you think it has) for a number of years, doesn’t mean it will continue to do so. By letting go of my food rule around cooked fruit (which for so long I thought was shielding me from mushy and unpleasant eats) I have opened the door to dozens of new experiences and flavors for me to try. I know that they may not all be perfection, but I’m pretty confident that it will pay off with huge, delicious dividends in the long run. Preheat oven to 350 degrees. Prepare 6 small ramekins or an 8-inch square baking dish by spraying with cooking spray. Combine chopped fruit in a bowl. Add agave and toss to coat. 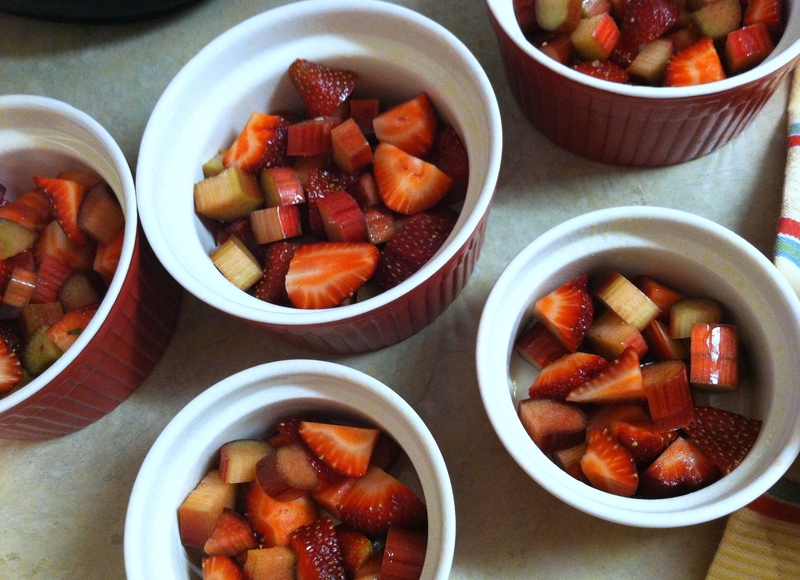 Distribute evenly in ramekins, or spread across your square baking dish. In a medium bowl, combine quinoa flakes, millet flour, hazelnuts, stevia, cinnamon, and salt. Whisk together. Add melted coconut oil and vanilla extract to bowl with the quinoa/flour mixture. Work together (I suggest using your hands), to incorporate the oil and vanilla well. The mixture should become crumbly and slightly moist. Distribute this topping over your ramekins or your baking dish evenly. Remove from oven. Eat warm or store in the refrigerator, covered, for a couple of days (rewarming if desired). Serve as is or with agave, ice cream, yogurt, or coconut cream as possible toppings. You all may not be aware of this, but for about the last 18 months or so, my fair city has been in the throes of a bagel crisis. You see, we Portlanders generally like our goods locally sourced, carefully tended to, and not mass produced whenever possible. Our city is a bit of a haven for small business owners and even when they begin to spread their wings and fly off into other areas (ahem . . . Stumptown Coffee is NOT FROM Brooklyn), we still hold them dear to our hearts. When it came to bagels, one local business had the city wrapped around its little flour-dusted finger – Kettleman’s. Kettleman’s Bagels had been around for several years, had established five locations throughout the city, and served up some very tasty bagels. Though a few other local bagel makers existed, it was Kettleman’s that had a large, devoted following and graced the breakfasts (and lunches) of many citizens on any given day. Then, completely out of the blue, a bomb dropped. To the Einstein Bagel Company. Noooooooooooooooooooooooooooooooooo. Not only had Kettleman’s been sold, but to be sold to a large, national chain ready to serve up mediocore (not locally sourced) coffee alongside mass produced (not made carefully with hipster love) bagels was devastating. Portlanders revolted. The Willamette Week paper set out to try to find a suitable local replacement. New bakers and chefs jumped in and tried to fill the bagel void. We’re still recovering. We’re trying to find our way through as a bagel-loving community, one day at a time. I have eaten other locally made bagels since. Some have been good. Some have not. Last week, by the way, Einstein’s announced it was closing THREE of its shops in the Portland market, just a year after trying to take over the city (I should tell you they also bought out all the Noah’s Bagels outlets locally, too, turning the city into a little Einstein’s monopoly). Hah. Take that, Einstein Brothers. Sorry. Sometimes, I get a little vengeful. 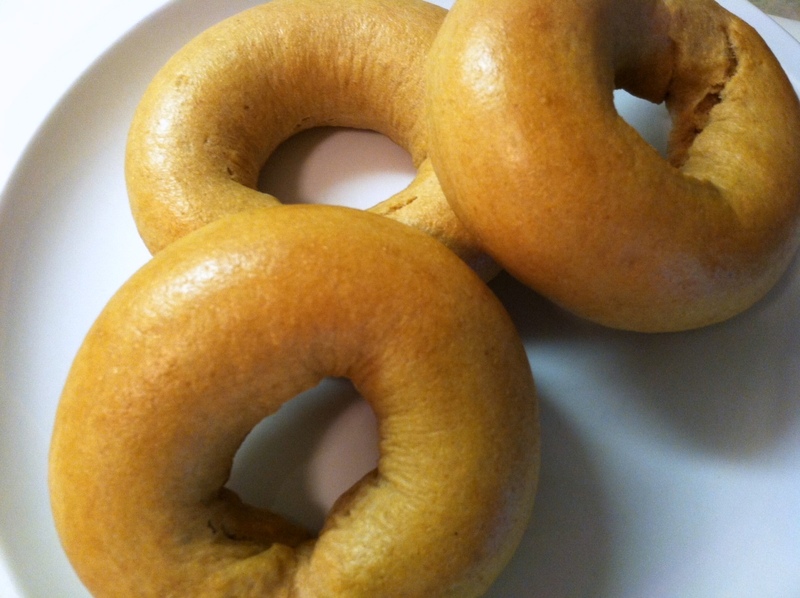 Because of all this, I decided to reclaim my own bagel destiny and make my very own bagels – in my very own kitchen. This was an intimidating process for me, because bagels are the type of food that I imagine are always best purchased from a bagel shop, fresh from the oven, wrapped in a little waxy sheet of paper or brown paper bagel bag. There’s something about the experience of that process that adds to the eating experience. Making bagels was a totally foreign concept to me and I spent quite a good deal of time looking up various methods and recipes on the Internet. Most were straightforward and pretty similar to one another, so I plunged forward. I made two batches and 4 different flavors. The first batch was made following this technique found over at the Happy Herbivore Website. I made four large bagels from this recipe and left them all plain – just wanting to experience the bagel in its purest state. The second batch was made following this technique found at The Veggie Converter. This batch made up about 10 smaller bagels. 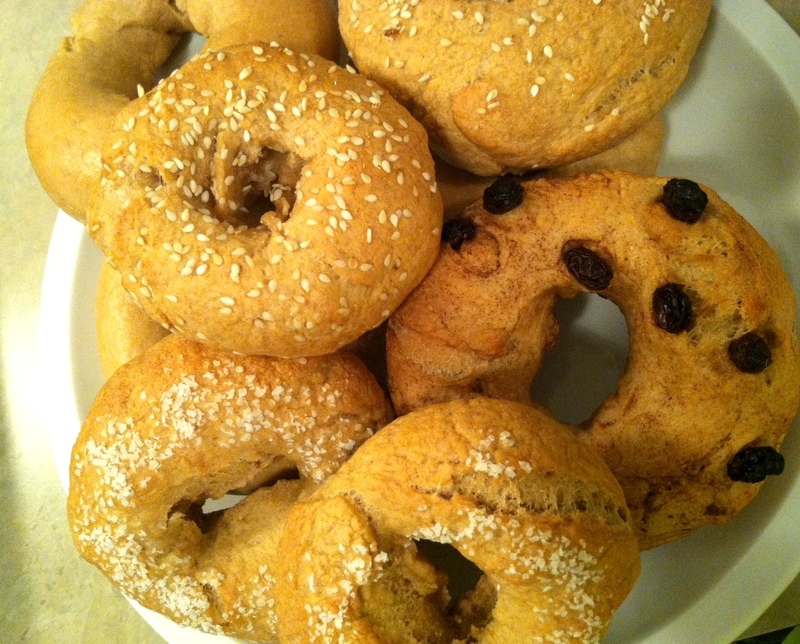 I mixed this group up and made a few each of cinnamon-raisin, garlic-sesame seed, and salted bagels. Both batches were made by boiling the bagels briefly before baking and both batches were very, very good. 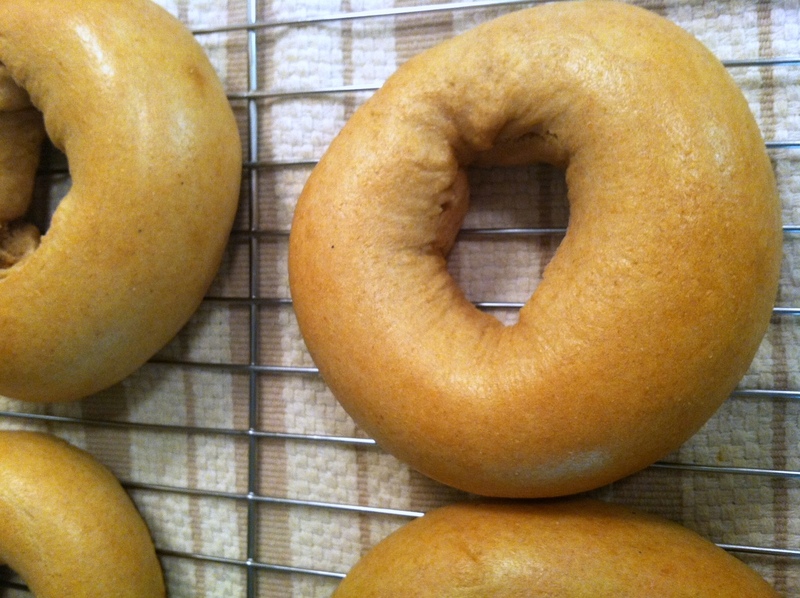 I used white whole flour in all of my bagels, which I know makes them a bit denser than if I had opted for all-purpose flour, but I don’t mind that and appreciate the slight health benefits from making that switch. I must say, the process was very simple. Mixing the dough was a breeze (I have a stand mixer now thanks to a generous gift from Mr. Move Eat Create’s family), the boiling part was kind of fun, topping them was a cinch, and the baking requires little attention other than popping them in and out of the oven. I do have a couple of specific thoughts about the methods I tried. First, both methods for creating the dough holes (rolling the dough out into long strips and then closing them together to create circles versus making balls and then sticking my fingers through the center to work a hole into the ball) worked well. Even though it was slightly more work, I think I preferred rolling the dough out into long strips, because it just created a smoother, more attractive bagel surface. Second, even though both recipes called for small amounts of sugar, I think I would decrease it even more. Unless I’m making a sweet bagel (i.e. cinnamon raisin), I just don’t think it’s necessary. Overall, I highly recommend giving homemade bagels a try. They are, quite frankly, one of the less fussy things I’ve made in a while and they tasted really, truly good. I enjoyed their texture, ability to re-heat, and the freedom I had to make up as many flavors as I wanted. I will most definitely make homemade bagels again. Though, I do still miss you, Kettleman’s. Serving Suggestions: Get creative with your toppings and flavors. Now that I know I can make them, my brain is wild with the possibilities! Things I want to try include poppy seeds, sunflower seeds, onion, blueberry, and jalapeno. 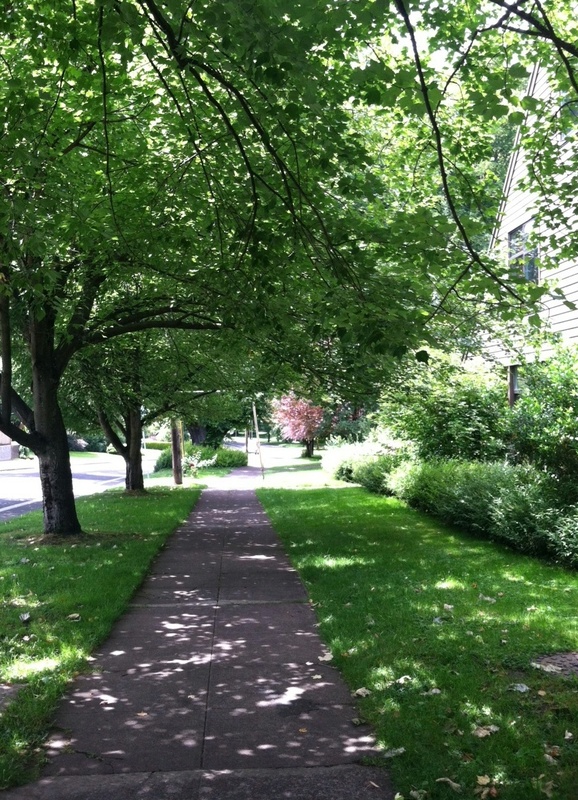 Lessons Learned: I faced down some apprehension with this week’s topic. For whatever reason, bread making is an intimidating process for me, especially bread making that specifically involves kneading of any sort. Add to that the very specific experience of bagel eating that I have in my mind and I felt like I was trying to pull off something that was impossible to re-create. In reality, though, I learned that some images are just that – images. They may be wonderful, but they are not the only thing that is wonderful. Re-fashioning my notions of what a good bagel experience could be was achievable and being able to create something so enjoyable with my own hands and means was totally gratifying. 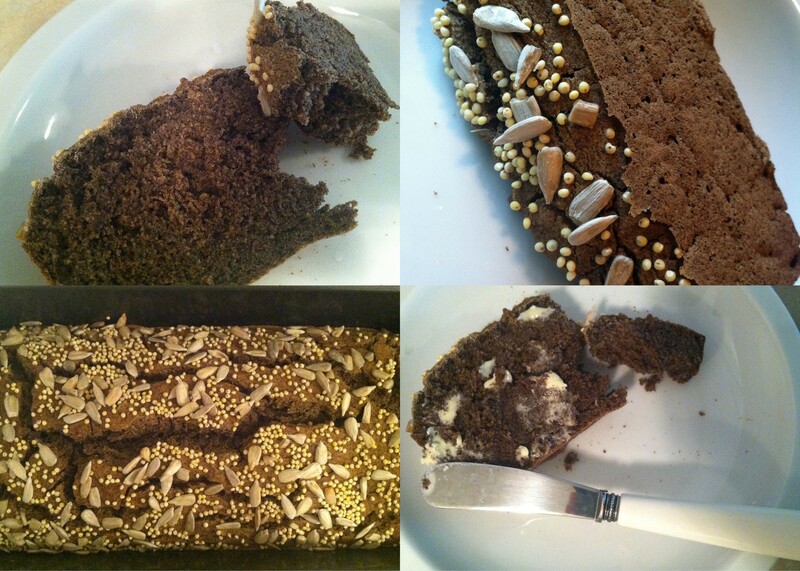 I could write a typical narrative here – an introduction to this recipe or a recap of the process of making them. But I don’t really have it in me right now. This week has been difficult. For many, many people it has been devastating. I have read dozens of thoughts across the web on the week’s events and I have appreciated each and every one of them. But right now, I just need some: Comfort. Calm. Serenity. Scones do that for me. Preparing them is soothing (the cutting of the butter or butter-like ingredients into the mixture; the folding in of berries) and eating them is even better. 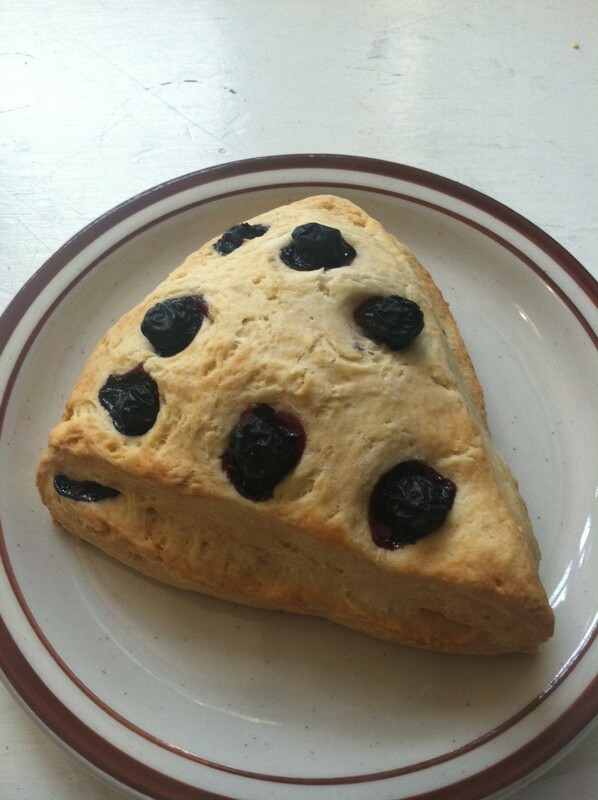 A well made scone is one of my absolute most favorite things in the world. So I present these scones to you today in a gesture of goodwill, because sometimes the simplest things can provide the comfort that we need most. May they nourish your body and spirit. Preheat oven to 350 degrees. Line a baking sheet with parchment (or spray lightly with cooking spray). Prepare your blueberries by placing them in a bowl with a couple of tablespoons of additional flour. 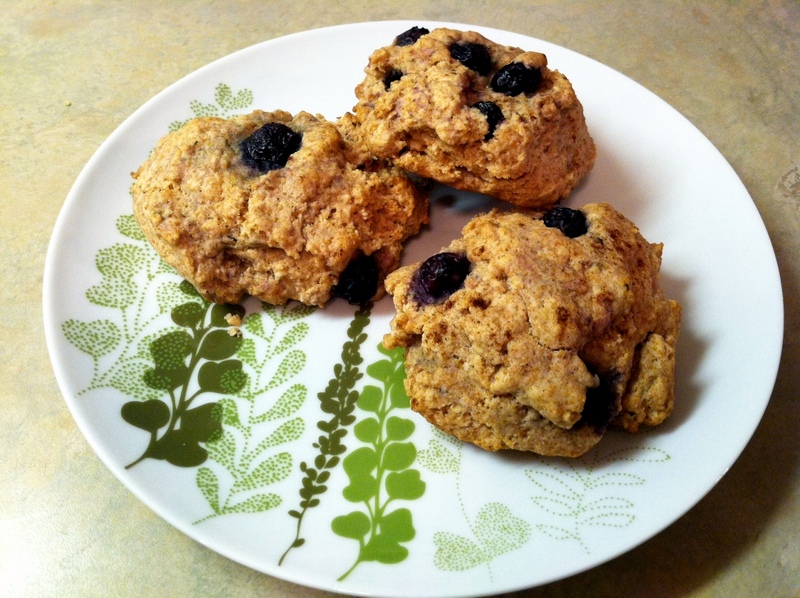 Roll around until blueberries are lightly coated with the flour. This will help keep them from ‘bleeding’ into the scones as they bake. 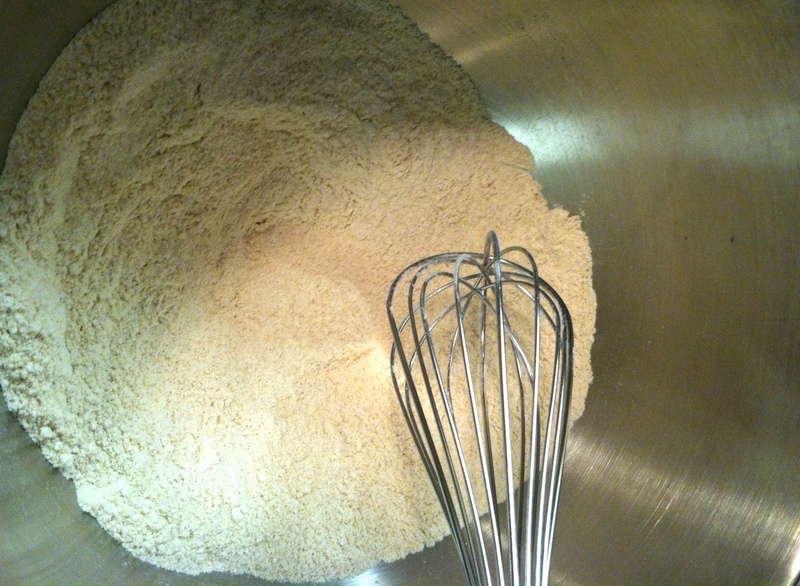 In a large bowl whisk together 2 cups flour, the baking powder, and salt. When combined, add in the oil, agave and vanilla extract. Stir together until just combined. Pour your hot water into the batter and stir again until batter is moistened. 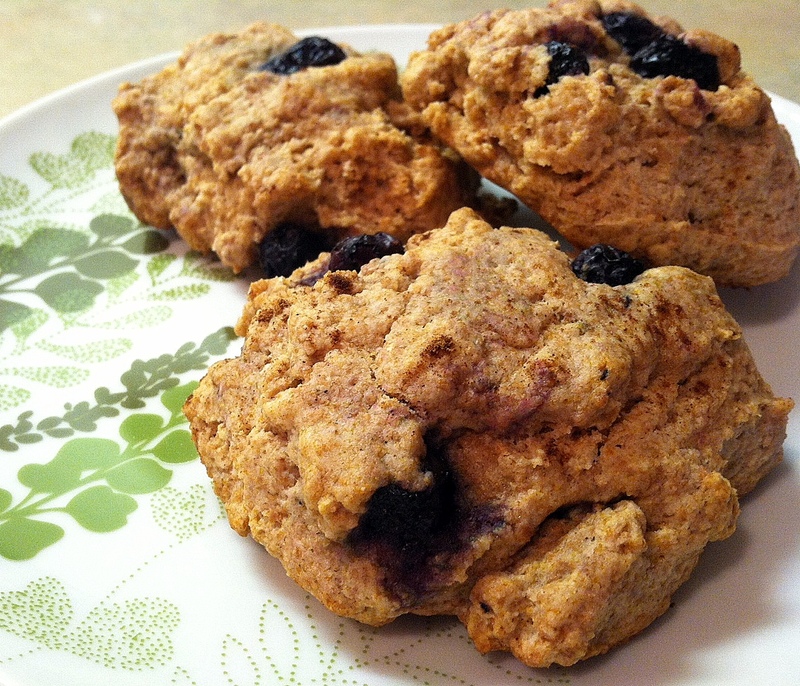 Dump in the blueberries that have been rolled lightly in flour and fold them into the batter gently. 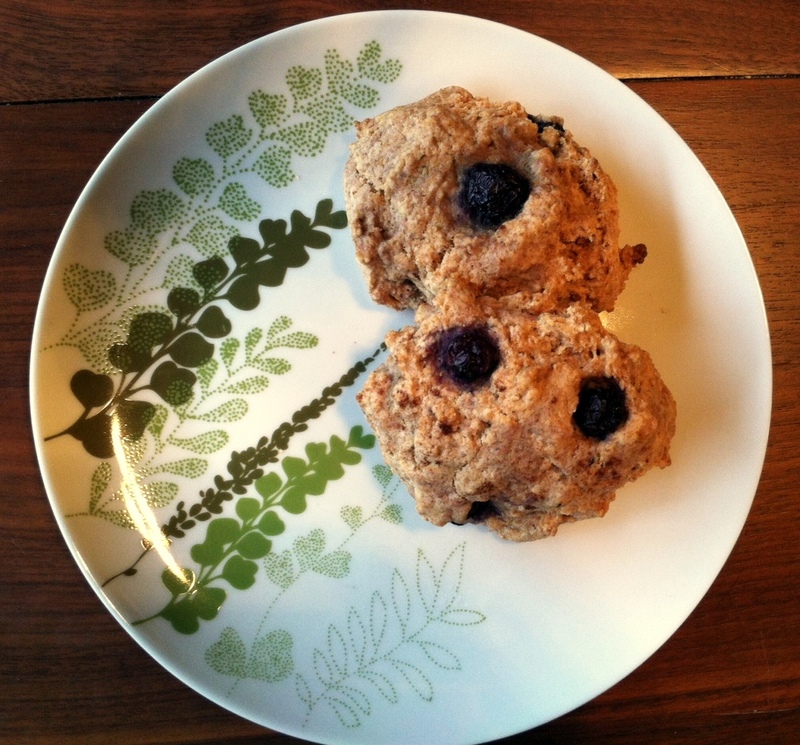 To create similar-sized scones, use a measuring cup (I used a ¼ cup size) to scoop up batter and drop onto your prepared baking sheet. If they are very tall, press down just slightly to even out. 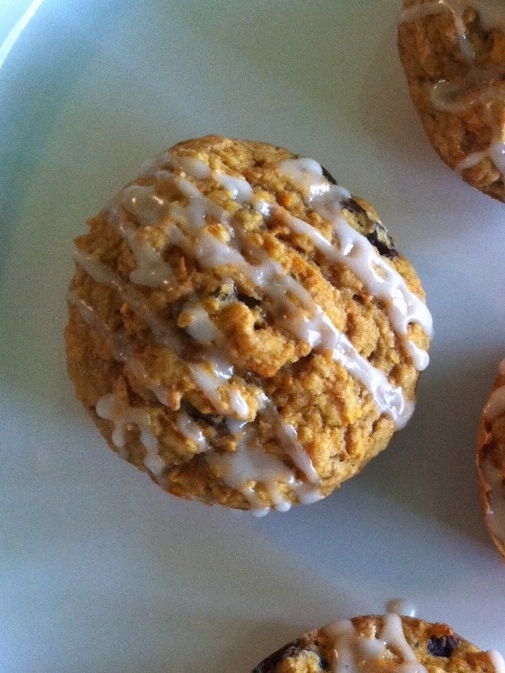 If you want the addition of an ever so slight cinnamon flavor (which is delicious), sprinkle cinnamon lightly over the top of each scone. Bake for 15-20 minutes or until the tops are golden and slightly firm to touch. Remove from oven and let cool on baking sheet for 10 minutes. Transfer to wire rack to let cool completely. These can be stored at room temperature for 2-4 days (if they last that long!). Do you ever get a craving you can’t shake? I don’t mean a craving that last for a few hours, but I mean for days on end. Usually, my cravings come and go. I’ll want something for an afternoon and by the next morning, my mind (and belly) have moved on to something else. I’m fairly fickle that way. I want all sorts of things all the time and it can change from one minute to the next. But, every so often, I get stuck on something and can’t let go of it. Such was the case with carrot cake. I’m not even sure what triggered this desire, but once it set in it wouldn’t be put off. The first day, I simply wanted carrot cake. It sounded good and it was on my mind. The second day, I REALLY wanted carrot cake. I was disappointed I hadn’t had some the day before and I couldn’t stop thinking about it. By the third, fourth, and fifth days, I was consumed with an unquenchable desire to shove carrot cake in my face. It kept running through my mind. My stomach churned at the thought. I fought hard to shake the impulse to schlep out to some mysterious all night bakery that didn’t exist and find a slice in the middle of the night. It’s true. Please try not to judge me. Instead of making a traditional cake, I decided to make cupcakes. I appreciate cupcakes for their self-contained, individually portioned ease and neatness. When there is a whole cake in front me, it’s too easy to just keep moving my knife to the right when I cut a slice, resulting in a portion that would feed a small family of four. With a cupcake, though, knife creep is not an issue. These are some of my favorite cupcakes I’ve made in long while. Truly tasty and sweetened largely with the banana, raisins, spices, and carrot, with a small amount of brown sugar for richness. You can eat them with the glaze, like I did, or leave it off and call them muffins. Regardless of which way you go, I don’t think you’ll be disappointed. Preheat oven to 400 degrees. 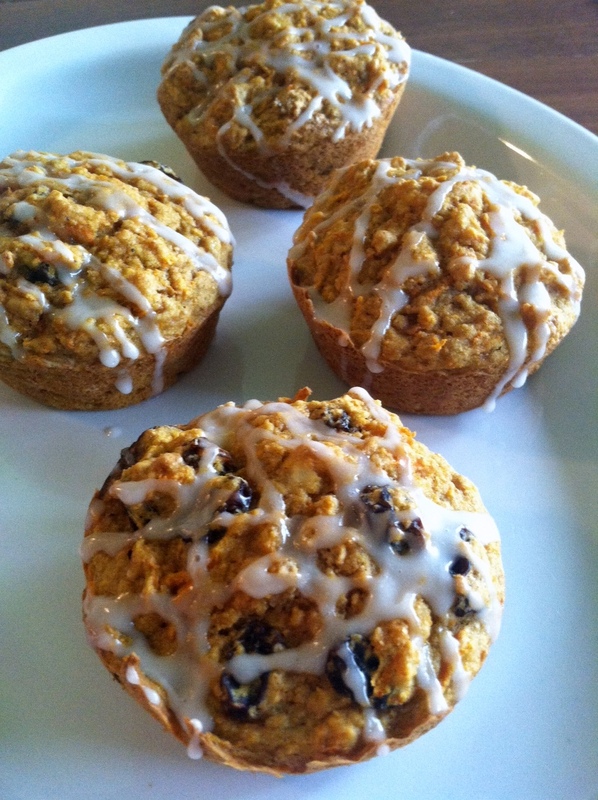 Lightly spray muffin tins with cooking spray. Place raisins in a bowl of hot water and let soak while you prepare other ingredients. In a large bowl whisk together flour, baking powder, baking soda, cinnamon, nutmeg, brown sugar, and salt. Once whisked, add your liquid ingredients: almond milk, coconut oil, mashed banana, and vanilla extract. Stir well to combine all ingredients. Drain raisins. Add them, along with the grated carrot, to the bowl. Gently fold them into the batter so that they are well distributed. 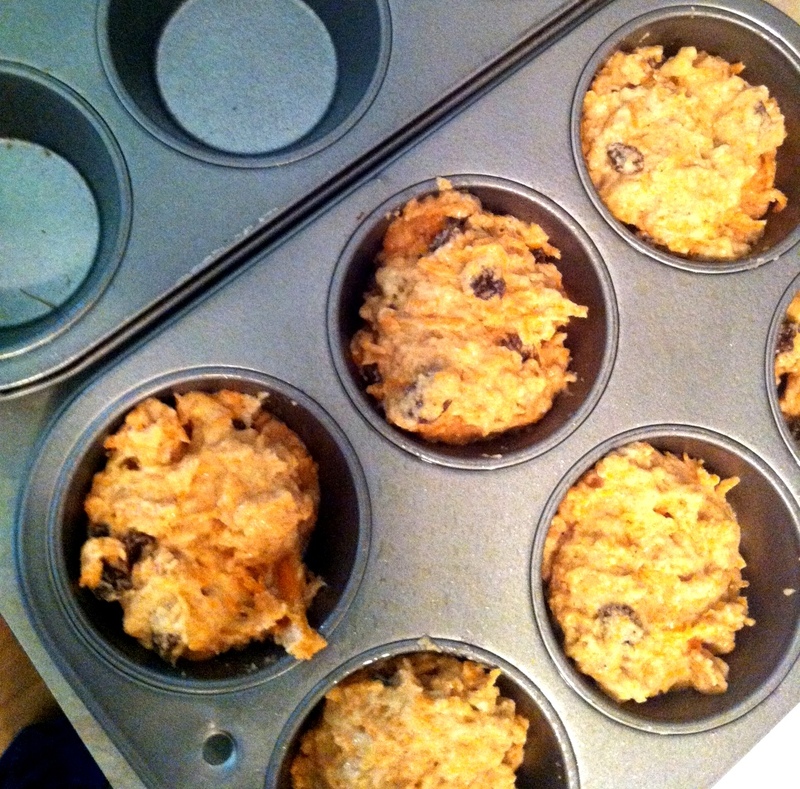 In ¼ cup batches, scoop batter into muffin tins. Bake for 18-20 minutes, or until a toothpick inserted comes out clean. Let cool 5 minutes in tins, then remove and place on a wire rack with parchment paper underneath. To prepare the glaze, combine 1 cup powdered sugar, 1 tablespoon almond milk, and the vanilla extract in a medium bowl. Beat together well. Add in additional powdered sugar and milk if needed to achieve the desired consistency. Note that the glaze will thicken after sitting for a few minutes. When the cupcakes are nearly cool, drizzle glaze over the top. Store in an airtight container at room temperature. I get really excited about food . . . and about eating . . . and about cooking. Food, when you remove social stigma and guilt and all that other gross stuff that can be attached to it, is so much fun. As a pretty unadventurous person (I am NOT going to be skydiving anytime soon), food is a way in which I actually get to take chances and try new things pretty much anytime that I want to. As much as I like this variety, I am also a loyal person and I am very loyal to certain foods. Certain foods (both singular ingredients, as well as fully formed dishes) are featured heavily in my dining rotation. I may go even so far as to call them my favorite foods. Though, please don’t think that because something isn’t on this list, I don’t love it. I fully reserve the right to add to this list at any time and please realize it’s not entirely comprehensive, but it is a start. I wanted to share a list such as this because I believe that learning what and how people eat can offer a unique insight into someone and I hope this gives you a bit more of a picture of who I am. Plus, maybe you’ll be inspired to partake in some of these items, too, and I’m all about spreading the foodie love. So without further adieu, here are (in no particular order) some of my favorite foods – those that make their presence in my life time and time again – along with a reason or two about why I love them so. Granola – I love granola. 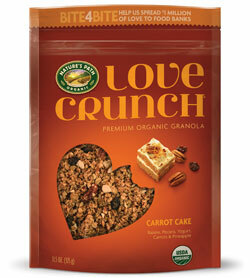 Correction: I am madly in love with granola. I could eat it every single day. I eat granola alone, with yogurt, and sometimes in bar form. But, my absolutely favorite way to eat granola is in a bowl with non-dairy milk. This makes me unbelievably happy. I have tried many kinds, but some of my favorites are Nature’s Path Organic Love Crunch Carrot Cake and Kind Cinnamon Oat with Flax Seeds. 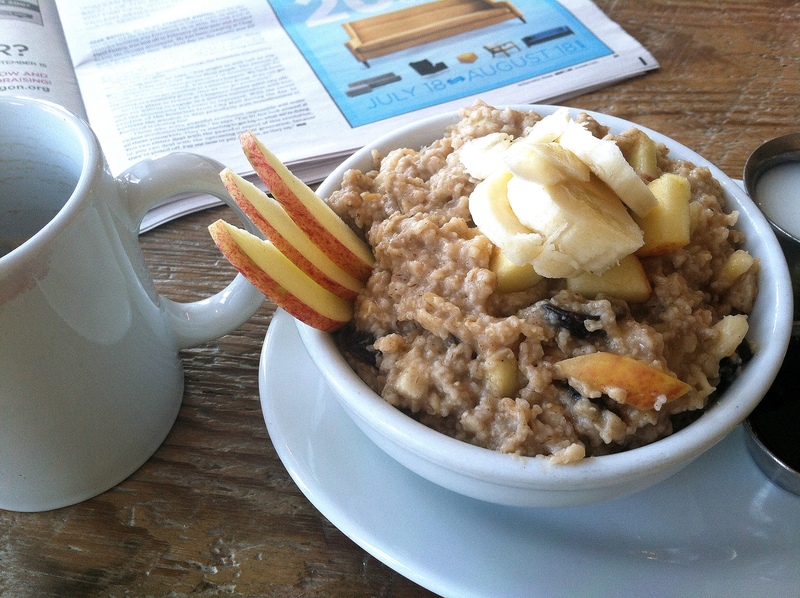 Plus, locally, the granola at Compote is OUT OF THIS FLIPPING WORLD. Healthy, hearty, delicious. Mr. Move Eat Create’s chowders. He makes both a broccoli chowder and a potato-corn chowder that are the food equivalent of cuddling up in a cozy, warm blanket. 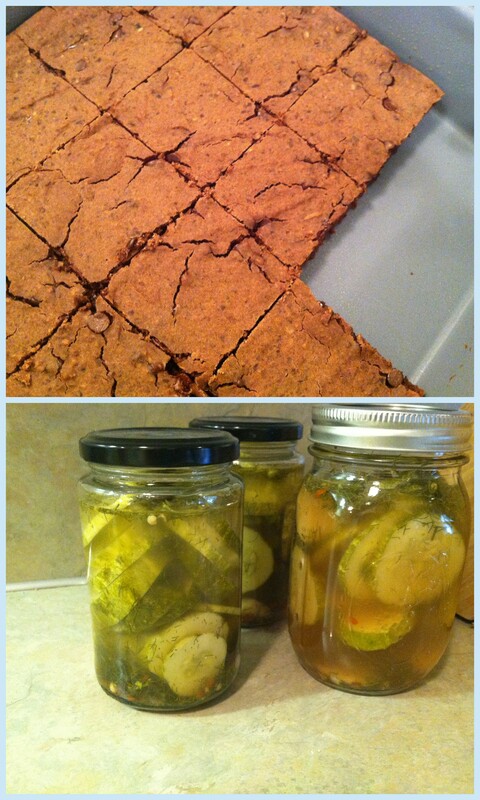 Serve them up with his from-scratch whole wheat biscuits and I am a happy woman, indeed. 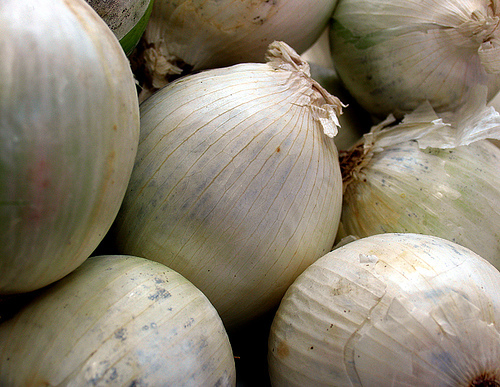 Onions and garlic. Any meal that starts by sautéing onion and garlic is a meal that I can support. Period. 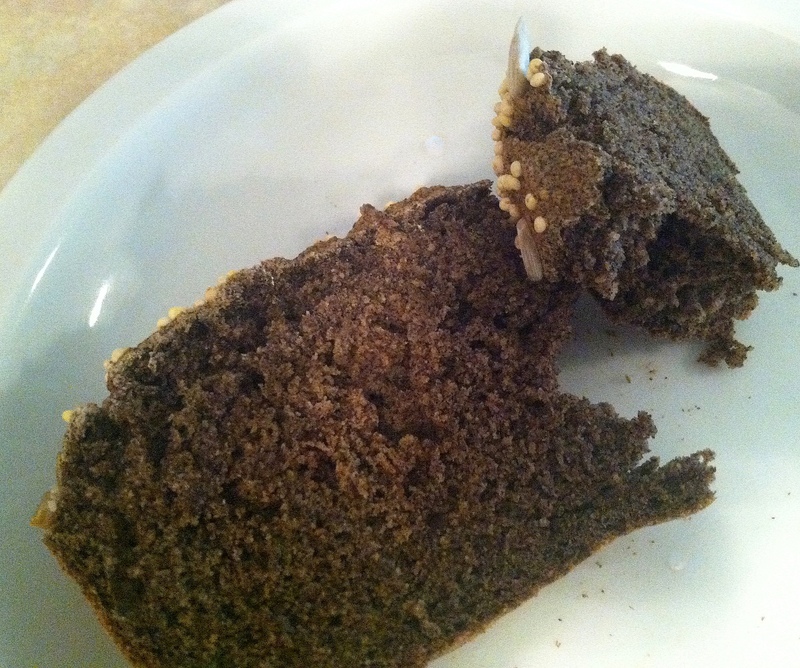 Dave’s Killer 21-Grain Bread with almond butter. I eat this all the time. 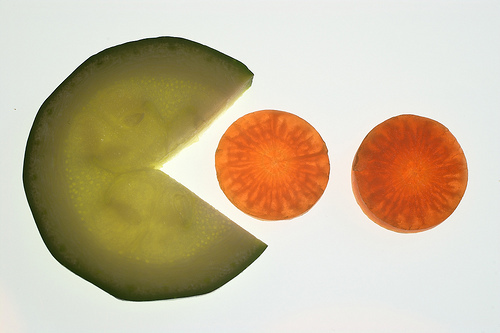 It’s breakfast, it’s a snack, its lunch alongside fruit. It is one of the simplest, most satisfying food experiences I have ever known. Thanks, Dave. My friend and roommate’s spinach and pepper lasagna. Serious comfort food, but made seriously healthy. Lasagna used to be on the bottom of my list when it came to Italian food, but not anymore. I request this dish over and over again and am never, ever disappointed. Some day I will take pictures for you and you will want it, too. Cauliflower – A vegetable so often shrugged off for being bland or unexciting, but that’s part of what makes it great. The versatility is incredible. You can do so much with it! 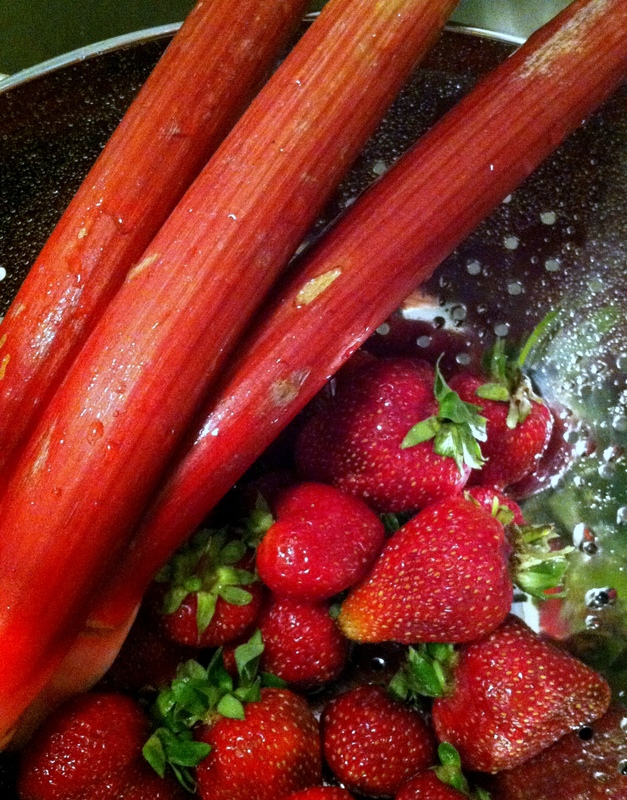 Plus, it’s loaded with vitamins C and K, giving it super anti-oxidant and anti-inflammatory properties. Woo! Non-dairy ice cream. More specifically, So Delicious Almond, Coconut, and Soy Milk ice creams. I just have no words. The name is totally deserved. I am rarely without some in my freezer. 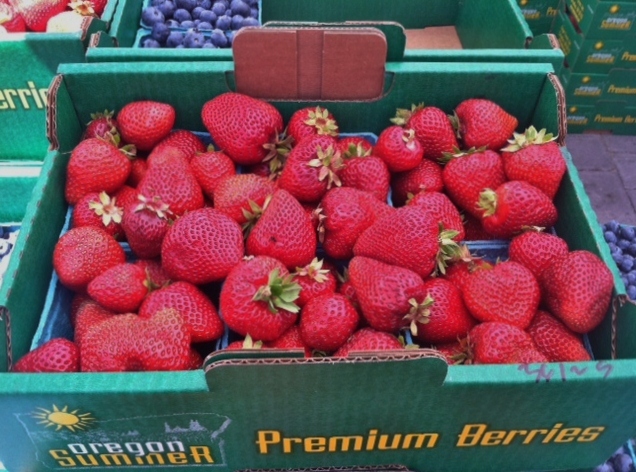 Berries – All types of them. I add them to my granola. I eat them straight from the carton. I use them in desserts. There is really no better grab and eat snack. Beans – If you can believe it, I didn’t think I liked beans until a couple of years ago. These days, I am happy to eat them. 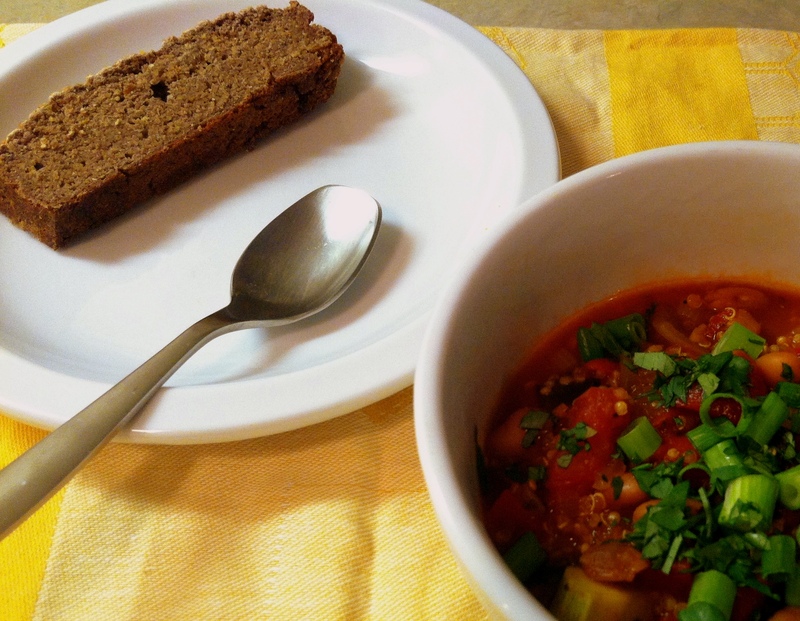 Full of protein and fiber, beans are not only delicious but adaptable to whatever cuisine I’m in the mood for. Black bean burritos. Kidney bean curry. White bean cassoulet. The list could go on and on and on. I’ll happily take ’em canned or dry! Vanilla & Cinnamon – I really don’t care what baked good you’re feeding me if it has these flavors. Just hand it over. I will eat it and be delighted by my two favorite baking spices. Just talking about it makes me want a muffin. Or a scone. Or a cookie. Or pancakes. Lemons – A go-to for me recently for it’s alkalizing properties in the body, I’ve been adding it to a glass of water in the morning to start my day. But long before that habit, I’ve known it’s wonderful to dress up just about any sauteed or steamed vegetable, as well as salads, baked treats and any other number of dishes (squeeze some on those beans I mentioned earlier and all of a sudden you’ve got a bright, savory main course ingredient). I could ramble on for quite some time, but I really should get going. Plus, this is making me hungry. #3 – Why I Eat . . . Plants!